Want to win a FREE PASS into Query Kombat? The Free Pass Contest is closed! 2. Comment your Query Kombat entry nickname below. (One nickname only. No bombarding the comments with numerous versions. But you may explain why you choose it.) I'll pick my favorite and announce my winner next Friday, May 3rd, when we show off the mentors and judges. Some nickname examples from my own queries (They're up above in the tab sections.) might be: The Fighting Hamsters, Extra-Crispy Rabbit Gal, Coughing Princess with Attitude, Have Wizard Will Travel. Yeah, okay, those were really off the top of my head. Anyway, that's all ya gotta do. Now, you'll have three chances to win if you subscribe and comment on each blog (SCWrite, Writer's Outworld). You even have a fourth chance to win if you use the QueryKombat hashtag to shout about your nickname. 'Cause if you think about it, 60 is nicely divisible by three...61 is not. Before I go, I want to thank SC for inviting me to help host this contest. And I want to really give Mike all the credit for coming up with the idea and doing most of the busy work. He got all these great agents! And a super big thanks to the agents for participating! So good luck! And show me those cute, humorous, scary, fun nicknames! On Friday we are releasing the details about the wonderful agents who will be viewing your Query Kombat submissions! There is a real variety in the 'wants lists' in this group of ten. (Yipee! Ten!) We'll be able to accept adult, YA, MG, and NA entries. I'll hint that they might like to see adult commercial, adult and YA science fiction and fantasy, romance, woman's fiction, and many more genres. Lots of these agents aren't the usual contest participants so prepare to be surprised. And the amazing Mike (the genius behind the contest) is working on coaxing a few more agents into the fold. To celebrate, we'll also be giving away three Free Passes starting Friday. A Free Pass will allow the winner to skip the screening process, pass Go, and head directly to a spot among the 64 Query Kombat entries. The Free Pass involves sharing a clever or amusing nickname. Just like in the NCAA basketball tournament, all our entries will have "school" nicknames by which they will be identified in the brackets. So stay tuned for Friday and work on those nicknames. With so many new friends stopping by the blog to check out the Query Kombat contest, I want to give a plug to a wonderful writer’s site, AQC. I was surprised the other day when someone questioned me on twitter about AQC. I thought every writer knew of about this vast mine of writing information. Apparently I was wrong. Agent Query Connect is a huge forum with all kinds of threads. 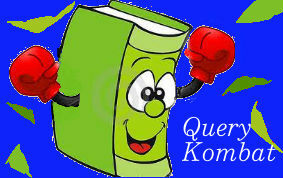 You can find discussions there ranging from the newest agents, to genre questions, to blogging. There is always someone ready to read your fledgling query letter and give you feedback. If you get a request and aren’t sure what to do: post your questions. Even the dreaded bore of the writing world, the synopsis, has a forum. There is a whole section devoted to self-publishing help. An area close to my heart that lists the upcoming contests and conferences. (Hmm, you might see something there about Query Kombat.) And for those who have a success story, there’s the Good News “Boast” Bar. That is just a small part of what is available. It would take weeks to discover it all. But best of all, if you look down toward the bottom, there is the Member Moderated Groups by Genre. Here is the place to relax with other writers that have the same interests as you. It’s a place where you fit in, and if you spend enough time there, they’ll become your writing family. Nobody understands the ups and downs of this crazy industry like your writing family. They commiserate when your full is rejected. They cheer you when you get an offer. I'd be lost without the Speculative Fiction group for fantasy and science fiction geeks like me. I honestly admit that I would still be the stupid newbie if not for AQC. So if you drop by, don’t be afraid to create a profile and launch a post in the Guppie Pond. I’ve never met kinder or friendlier writers. I promise they won’t bite. Be sure to give me a shout and invite me to be your first friend. 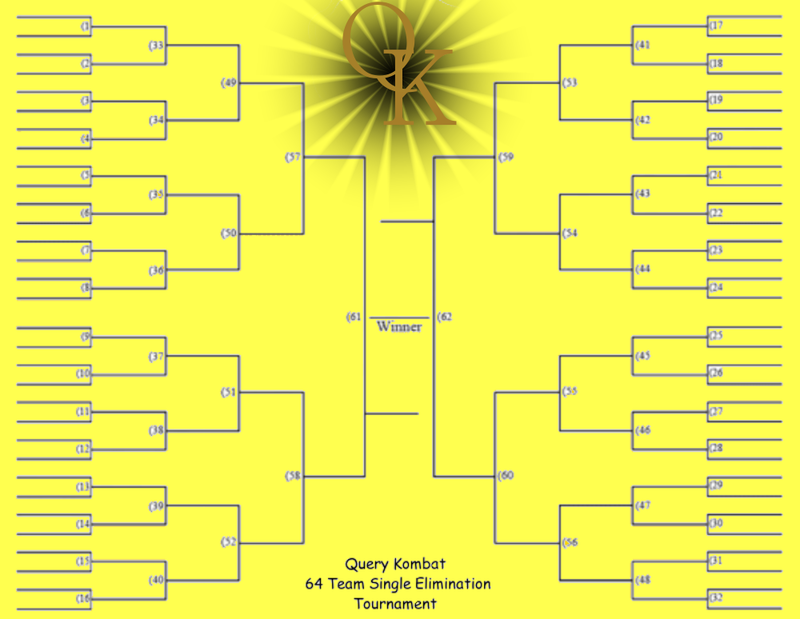 Announcing the Query Kombat Contest and Tournament! Bloggers SC Write, Writer's Outworld and I are teaming up to bring you the first ever Query Kombat Tournament. (If you are here for Terri Bruce's cover contest go here.) Now with 10 agents. 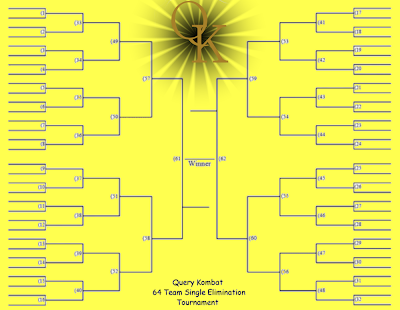 Query Kombat will host 64 kombatants in a single-elimination, tournament style query-off. There will be a total of six rounds in Query Kombat. First opponents will be grouped by target audience (ie. YA, NA, Adult, and MG). After that, a bracket-style grid will dictate future opponents. If you secure a spot in the tournaments, your query and the first 250 words (to the end of a complete sentence) will be pitted against another query and first 250 words. Judges will read each match-up and vote 'Victory' on the best entry (Remember, this is subjective). The entry with the most ‘victories’ will advance to the next round until only one champion remains. A growing list of agents (which will be revealed at a later date) will browse the semifinal round to make requests on at least one of the final four queries. Details below. If you make it into the third round, you will be paired with an agented writer who will act as a trainer to shine up your query and first 250 words. Edits are due back three days after teams are announced. Before the start of the semifinals (round 5), agents will be invited to the blog to make requests and choose one query they think will become tournament champion. Agent(s) who guess correctly will receive a full or partial (their choice) of the selected manuscript one week before the other agents who requested material. To clarify, agents can make as MANY requests as they want, but can only bet on one query to win. One week after the contest closes, we will be posting the final eight queries and invite agents back to make more requests. The tournament is open only to unagented writers seeking representation. Your manuscript must be complete, polished, and ready to submit. Submissions for MG, YA, NA, and Adult works will be accepted. No picture books or non-fiction. The submission window will open at 11AM EST on Monday, May 13th and close at 11AM Friday, May 17th OR WHEN WE RECEIVE 225 ENTRIES. You may submit entries for two manuscripts (in the same email) but we will only consider the second entry on the last day of the submission window. Kontestants will be revealed May 24th and the tournament will kick off on May 28th. In order to enter the contest you MUST follow formatting guidelines, and submit during the contest window. All entries that follow those guidelines will be considered. In the event that we receive more than the available spots, hosts will be assigned a group of queries and pick the best of their group. We will also select a few alternates. Sixty-four queries will enter into the tournament. For the nickname, make it as unique as possible so that there are no duplicates. These will be the names used in the tournament brackets (or an abbreviated version if it's too long) so keep it PG-13 and try to have it relate to your story in some way. 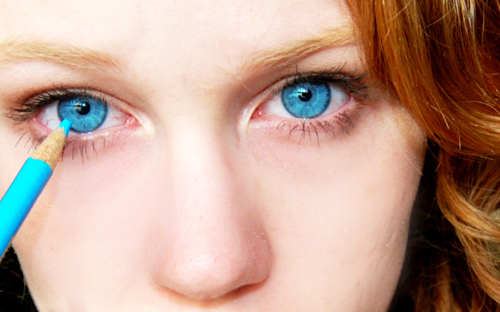 Fifteen-year-old Maxine Protega became a god and a demon overnight. Prophesied to abolish magic by one faction of her people and protect it by another, she’s cast into the middle of a campaign that’s ripping her world and her family apart. As it turns out, the prophecy is of the self-fulfilling persuasion, and Max finds herself on the fringes of a worldchanging choice: eradicate her race by destroying magic, or risk the slaughter of her family by protecting it. All queries submitted are FINAL. We will not edit them in any way, shape, or form. Please read, reread, and rereread your submission before you hit send. Unless you make it into the third round, you will not have another opportunity to edit your query or first 250 words. You have several weeks to polish your work. Take advantage of it. Competition will be fierce. Because the immense amount of work ahead of us, the tournament will be hosted on three separate blogs (following each of us would be a great way of saying thank you...just saying): Michelle4Laughs will host round 1 and 4. SCWrite will host round 2 and 5. Writer's Outworld will host round 3 and 6. Each blog will have links to all rounds so fear not. You will not get lost. Questions can be left in the comments and I'll answer them as quickly as possible. (Afraid I'm at work so it won't be right away.) So, yeah. That's it! I think this calls for celebration, don't you? I want to thank everyone who came by and left their opinion on the cover art for Kindar's Cure! You guys were awesome! Masako M. is the winner of the autographed copy. Congrats to her! I'll get that out to her as soon as I have the first paperbacks. I wanted the contest to give an idea of which cover looked the best to the most people and the response was huge, but also unexpected. The vote was so overwhelmingly one-sided that I didn't have to actually count. You guys really made your desire known. The general consensus was for the white cover which was choice number 4. Now while I did love how well the white off-set the green of the photo, it didn't exactly shout epic fantasy. The cloud effect is a little on the romance side. 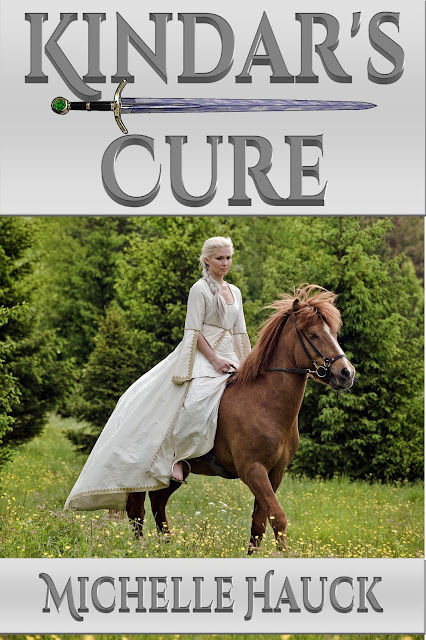 And while there is romance in Kindar's Cure, I wanted the cover to fit as much as possible into the right genre. So my wonderful publisher came up with a compromise that I hope satisfies all sides. It keeps the white which everyone loved. And on a happy note, the new font and color actually stands out better in a thumbnail size than the original concept. To me it is has all the elements. The perfect model of my main character while looking clean, clear and modern. So here it is: The Final Cover!! Thereafter Cover Reveal and Contest! I'm very excited to be a part of the cover reveal contest for Terri Bruce and Thereafter! It's seems like it has been forever since I read and enjoyed Terri's terrific first book, Hereafter. I can't wait to get my hands on Thereafter. And don't you think the cover model is fantastic? It's exactly how I picture Irene. 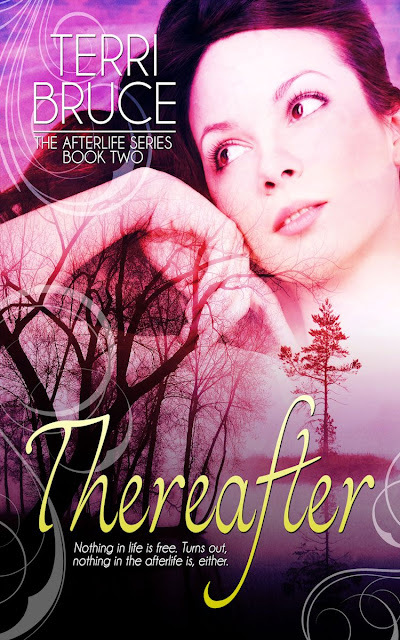 Author Terri Bruce is celebrating the upcoming release of Thereafter, the second book in the Afterlife Series, with a scavenger hunt/giveaway! One Grand Prize winner will receive a set of 20” x 30” unframed cover art posters (1 each for Hereafter and Thereafter), signed by the author, and an eARC of Thereafter! Five first place winners will receive eARCs of Thereafter. Contest is open internationally. As a special bonus, everyone who enters the contest will receive, via email, a special sneak-peak excerpt of Thereafter, featuring Terri’s favorite scene! Nothing life is free. Turns out, nothing in the afterlife is, either. I'm always on open to new Getting the Call stories where writers can share how they got their agent, publisher, or decided to self-publish. If you have a story to share, please get in touch. I run the feature once a week or whenever I have a willing victim author. I've seen Easter Eggs hidden in favorite DVD's like the Lord of the Rings. My kids often show me things they find in their video games. I've come across a few myself when playing Zelda back in the day. But does anyone put Easter Eggs into their novels? You get the picture that we're not talking delicious candy treats or the product of chickens. These Easters Eggs are little hidden treats. To find them you have to follow a special procedure or sequence of steps, unless, of course, you stumble upon them by accident. They can be funny scenes, an unexpected reward or piece of equipment, maybe a whole hidden level. Often times they are inside jokes that a game or video creator has stashed away for only the industrious to find. My teenage daughter has a very narrow definition. She insists true Easter Eggs are a reference to something not associated with the game you're playing but something that influenced the creator. For instance, in Zelda Skyward Sword you can slingshot your way to a picture of Mario and Luigi, who are obviously not characters in this game. It's a pop culture reference or shout out to the famous and infamous. But can you put Easter Eggs into books where everything is in perfect view? You can't hide behind words. Or can you? I admit that I can't resist, though most of mine are in the inside joke category. My favorite word is capricious. Capricious makes into each of my manuscripts exactly one time. And, let me tell you, it was hard to work that jawbreaker into the middle grade hamster story. It ain't exactly everyday language. I've included shout outs to my favorite sports teams. You find banners of the Chicago Cubs and Bears hanging in my YA dystopian. The hamsters worry about being painted blue and gold, a reference to my Fighting Irish. Besides inside jokes, I also enjoy planting little seeds in my manuscript that have double meanings. (No, not those type of double meanings, creaper!) Meanings only I know about that actually apply to something in the story. Keep an eye out for blue butterflies when Kindar's Cure is released and in my short story, Frost and Fog, coming from The Elephant's Bookshelf this summer. See if you can figure out the significance. Edit: I forgot one I planned to share. 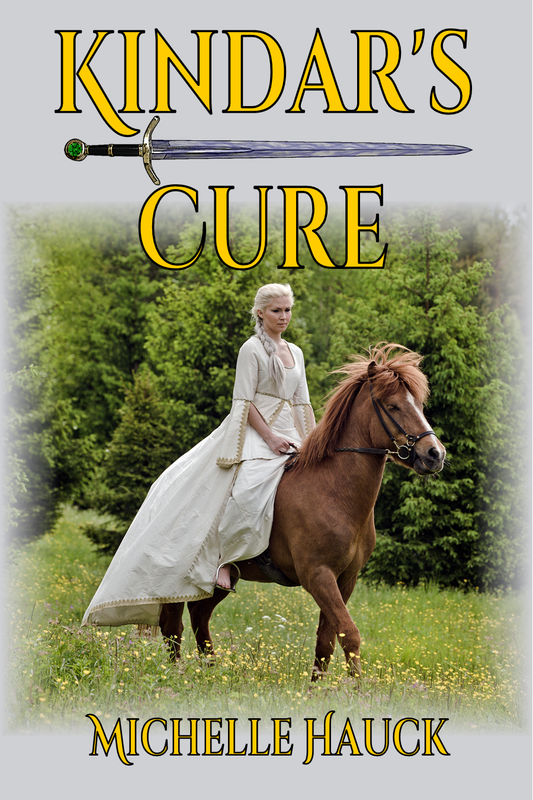 In the opening of Kindar's Cure, Kindar's mother says she looks like a washed-out rabbit. That's a shout out to my YA dystopian where the mc is an actual rabbit! So how about you? Any hidden plants to own to in your own writing? 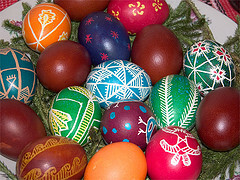 Do you have a favorite Easter Egg or maybe one you discovered? This post is a little bit different this week. Jean Oram, moderator from AQC, is here to share some of what she learned about being an author. The first part of her post is here on my blog. To read the rest of her post which applies more to her self-publishing journey, you'll have to go her blog. The link will be at the bottom. I read her book in less than two days. Fantastically written, the characters kept me guessing until the last moment. A very enjoyable read! Michelle asked me to share a few of the lessons I've learned since my book’s launch. I had so many things pop to mind—many of which most authors don’t warn you about—that Michelle and I decided to break my list into two posts. This post, here on Michelle’s blog are all-round tips that can benefit both traditionally and independently (self-published) authors whereas the other half of the tips posted on my blog, The Helpful Writer, are must-read tips for indie authors (even though they can also help the traditional author). Both lists can benefit all authors and we encourage you to read them both. Hold onto your hats! Here we go. 1. Edits will take at least twice as long as you think they will. And a part of you will always want to do another round—even though edits can be tiring and difficult. Start early on your edits. Always. 2. Pay it forward with other authors out of the goodness of your heart. Look for ways to help others without expectation and you will be stunned by how absolutely amazing and wonderful these people are when your book comes out. Warm and fuzzies! 3. Be kind. Always. Always. Always. 4. Make sure your website and social media profiles are up-to-date well ahead of time. At launch this is the last thing you want to stress about. 5. Have a prominent sign up link on your website’s homepage so readers who come check you out can sign up for new book updates. i.e. an author newsletter. This is a great way to stay connected to your readers so they don’t forget about you between books. 6. Join a posse of people who know what they're doing. Support systems rock and it is nice to have people who know the ins and outs of publishing and can help out, answer questions, chat, etc. Publishing can feel like a solitary endeavour, but it doesn't have to. You can also cross-promote and have fun while marketing and holding contests! 7. Visibility. The biggest thing that can go wrong with your book is obscurity. Books need readers. Get out there and get your book out there. There are tons of reading sites that are looking for new release books, books to review, etc. This can be time consuming, but this is why you have #6--your posse. Share your tips and resources with each other. Publishers can't do everything these days. 9. Watch for book pirates! Eek and arrr! 11. Write the next book. Always be writing the next book and let your readers know you are working on it. They love the feeling of knowing what an author is up to. It feels personal and they become invested in this new product before it is finished. Plus, more books equal more exposure, more readers, and more hooks out there in the world. It is also your best publicity. Me? I'm about 1/4 of the way through the first draft for book two of the Blueberry Springs series. How about you? What lessons have you learned on the path to launching a book? (You can include things you’ve learned from watching others.) Let us know in the comment section. P.S. Don't forget to read part 2 on The Helpful Writer. 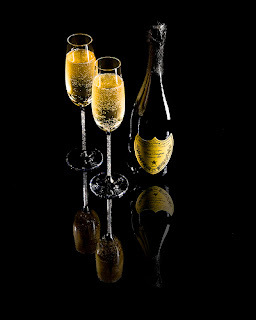 You can check out Jean's book, Champagne and Lemon Drops: A Blueberry Springs Chick Lit Contemporary Romance for free on Amazon.com, Kobo, Barnes and Noble, and Smashwords (with more vendors to come). One woman. Two men. One meddling small town. Raised by her older sister in the small town of Blueberry Springs, all Beth Wilkinson wants is to create a family so big she’ll never be alone. Things are going great until her accountant fiancé, Oz, throws their life in the air, sending her on a journey of discovery paved with choices--including whether to return to her old life. 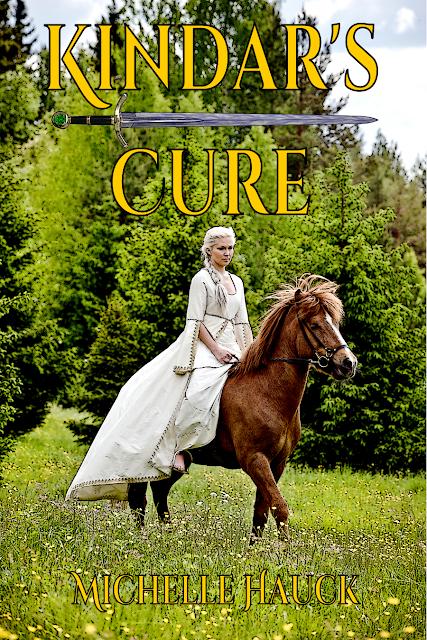 Kindar's Cure Cover Reveal Contest! The day is finally here! This is a contest so you guys can let me know which cover you like the best. And yes, there is a prize, but more on that later. Your vote and opinion matter. I want to hear if you think anything needs tweaked or if you have a clear favorite. Put your pick in the comments. The cover with the most votes wins! I want to say a special thanks to Ken Tupper at Divertir Publishing for really taking my wishes into account and suggesting this contest. He went out of his way to include Kindar’s sword in the cover and made the image match the description, right down to the blue tint of the blade. After all, a princess is nothing without her sword. Originally, the cover contest was supposed to be a choice of three different cover pictures, but one picture just stood out above the rest. After looking at literally hundreds of photos, one image just fit my story. The model was Kindar and it also fit the mood I wanted to create. Though I gave Ken five possibilities, he insisted we go with the picture I really loved, giving a few adjustments to the basic design. 1. The original cover art without changes. 2. With Line Art outlining the picture to make the small version stand out more. 3. Green fringe to help the title stand out. 4. With white fringe for the same reason. Now for the prize! 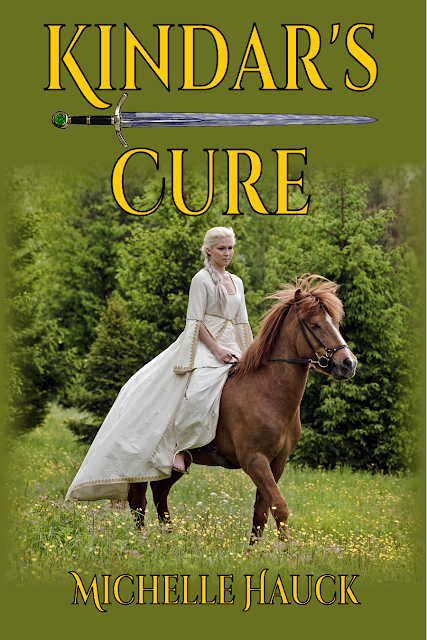 I’ll mail an autographed copy of Kindar’s Cure to the winner. You must live in the US or Canada and leave a vote in the comments, plus your email address in the rafflecopter. The prize will arrive around May 1st or as soon as I get my hands on the first copies!